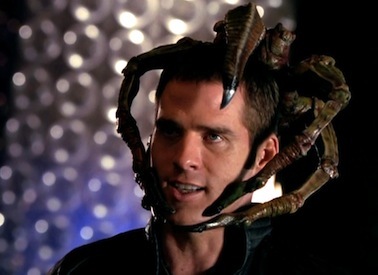 After continuing our journey with John Crichton last week with “…Different Destinations” and “Eat Me,” our Farscape re-watch continues this week with the seventh and eighth episodes of Season 3. I have always loved “Thanks for Sharing,” an episode that could have been one of the series’ more utilitarian outings, since it exists mainly to set up the circumstances that lead to the crew’s half-season-long division, effectively turning Farscape temporarily into two parallel shows, but which is a really terrific hour of TV. It isn’t an overly flashy episode nor a mindfrelling one, and I often don’t remember how much I like it until I see it again, at which point my love for it instantly comes flooding back. It’s something to do with the specifics of this planet and its situation–something about its film noirish atmosphere and design has always stood out to me amongst the series’ many alien planets and cultures; it’s probably a combination of the lie detector lobster, the traveling Jello-y chemicals that create an explosion when they touch, the siblings vying for the throne, and the overweight sovereign, hooked up to machines keeping him alive through tubes, reminiscent of the evil Baron Harkonnen from Dune–as well as the clever way that the split Crichtons manage to resolve the problem. At the start of the episode, Talyn is still severely wounded from the attack that occurred some time prior to the previous episode, “Eat Me,” which Crais, when he awakens, reveals to be the work of an elite PK retrieval squad sent to bring him under PK control, as they have again become interested in possessing him. The ship’s only chance for survival is chromextin, a stimulant that could potentially help heal him and which they discover exists on a nearby planet. Unfortunately, however, this planet is extremely unwilling to trade with them, particularly after Chiana and D’Argo attack its chief security officer, Tolven, after he sexually harasses Chiana in a bar, or “refreshment house,” as they refer to it. When Rygel argues their case and attempts to negotiate with Pralanoth, the planet’s ruler and Tolven’s father, the man won’t hear of it. He trusts his son, and his paranoid son doesn’t trust Moya’s people, wanting to know why they have two ships (Moya and Talyn) hidden in the planet’s bonosphere. He thinks Rygel and his people want to use the chromextin as a weapon against them and so has his security team fire on Moya and the weakened Talyn. In 0rder to stop the assault and in retaliation, one of the Crichtons has Crais lower Talyn down to the planet and target it with his big gun. Not realizing that it is out of commission, they agree to speak to John one-on-one, and so he comes down to discuss the situation with them, at which point Tolven places the “lobster” on Crichton’s head. The aquatic alien creature has the ability to tell when someone is lying–as explained in the episode, it “senses brainwave patterns, and is extremely sensitive to cognitive dissonance”–and has been trained, when it senses a lie, to shove its claw into the speaker’s skull and into their brain, instantly killing them. Crichton passes the test, naturally, given that neither he nor his crew have any designs against this planet. In many ways, it’s reminiscent of how the Scarran in “Look at the Princess” caused a great deal of trouble for himself simply due to assuming that Scorpius and Crichton were working against him. And it makes an interesting point about how all of these various planets that Crichton and Co. travel to all have their own stories and their own characters with their own agendas. The deceitful T0lven is so worried about securing the throne that he assumes everyone is working against him, even these people who simply want to fix their ship. Granted, the fact that these people are technically criminals, according to the PKs, makes them even more suspicious to him. But this episode’s major conflict is major driven by this man’s misunderstanding. Shortly after, Tolven’s sister, Sarova, asks for a secret meeting with Crichton at a refreshment house that she owns, where she discusses the situation with him, telling him about the fact that her father had determined that, after he passes, both she and her brother would co-rule but that he doesn’t want to share. They are soon afterwards interrupted by an explosion that nearly kills both of them. On a first viewing, this was probably the point that most viewers figured that the show was going to kill one of the Crichtons, because up until the end of the episode, there seems to be no reason to have two of the exact same character aboard the ship. They are identical in every way and given that, it didn’t seem that they could both be on every single week from that point on and so killing him off here seemed logical. And yet, this, in fact, turns out to be a red herring. John could have been fatally damaged, except Jool is able to heal him thanks to a blood transfusion from the other John, who won’t let him die. (Speaking of which, by using her medical skills to save him, Jool is ever so gradually acclimating to a more welcome member of the crew. Her position is, of course, still the most tenuous of anyone on board, but the fact that she’s being useful, even if begrudgingly, is a major step.) On a metanarrative level, the show is basically winking at the audience, “Nope. We’re not getting them out of this situation that easily.” Of course, one of the Johns will die eventually (and, in fact, it’s the one who is wounded here, which foreshadows that) but only once his presence has left a major impact to the point that at least the people aboard Talyn have come to think of him as the real John. On a textual level, however, the nifty thing is that the two Crichtons end up serving a significant purpose, because the fact that there is a Crichton who wasn’t wounded means that he can go down to the planet and cover for the other one. Tolven, more paranoid than ever, had heard news from his spies that his sister had taken a meeting with Crichton and had therefore now come to assume that they were both plotting against him. But the fact that, only shortly after having been critically wounded, Crichton is able to waltz into the office in perfect health allows John to prove that story false. And when the lobster goes on his head, he can then even completely factually state that he hadn’t been at that refreshment house with Sarova and that he hadn’t been involved in an explosion–a truly brilliant move. But, as it turns out, Crichton doesn’t end up being the only red herring surrounding the explosion. On a first viewing, it’s safe to assume that Tolven had tried to assassinate Crichton and his sister (who else could it possibly be? !, and so when he puts the lobster on his head and manages to survive the questioning–even when John accuses him of having tried to kill Talyn by mixing the stimulant, chromextin with clorium which, as we know from the second episode of the first season, “I, E.T.” is a powerful Leviathan anesthetic–we just figure that he has trained his mind to trick it. Even his father confirms that some people can do that, but that either way, he trusts his son. Naturally, we don’t, and neither does Crichton. And this seems to be confirmed as true when John sarcastically says that Tolven has been a “good and loyal son,” and suddenly the lobster starts to tense up, having sensed a lie brewing in Tolven’s head. John then asks the question point blank, and Tolven says he has, resulting in his brains being dashed out. And so, again, the first time through, it just seems that Tolven had been thrown by the fact that it hadn’t originally been in the form of a question, coupled by growing nerves and a diminishing sense of control over the situation. Yeah! I’m so happy that you are back writing about Farscape! You’re right about how on a rewatch you understand much more–I think it wasn’t until I saw it a second (or third?) time that I understood that the Corlata was a shape shifter that killed Sarova and took her place. And, of course, “Green Eyed Monster” is one of my favorites–so romantic and a good mystery, especially the first time you see it and you think Crais is doing all the mean stuff to John. And you should have a macro key for the Claudia Black is brilliant parts…she really is. She brings Aeryn to life in a way I’ve never seen in any other heroine on television. Thanks for taking the time to write these. Mary, summer fruits beg to be used in a pastry like this. I am so longing for raspberries, blackberries, and blueberries I could pick in the wild – they were always smaller, but packed so much more taste. I made something similar with my kids a couple of days ago, using peaches. And now I have some wonderful Italian plums eagerly awaiting their tug!eGrnetinrs from California!